Cultural diversity at workplaces has been found to increase and improve team performance. However if not led properly, multiculturalism at workplaces can also result into sub performance and even conflicts among team members. One of the important areas for team managers to learn, is the ‘level of comfort’ of members of local culture background with colleagues of foreign origins. The book postulates that this ‘level comfort’ is an independent cultural dimension which differentiates national cultures at multinational workplaces. A deeper understanding of this cultural dimension is the key for success of team managers and leaders. 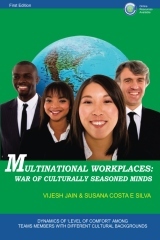 MULTINATIONAL WORKPLACES: WAR OF CULTURALLY SEASONED MINDS is a sincere attempt to familiarize managers and leaders with a completely new understanding of this inter-cultural comfort among multi-cultural team members. In addition to the own research studies done by the authors, those done by others and certain important insights into the similar people’s issues, have been explained in this comprehensive book on cross-cultural management. At the same time, theoretical foundations and supporting concepts have also been discussed in the light of a new perspective of improving performance of culturally diverse work teams in culturally charged multinational work environments. The larger aim of this book is to sensitize the team managers and top leaders in multinational enterprises to the importance of constantly dealing with people’s issues at workplaces, and to provide a road-map for devising a new approach of team management away from the methods of usual prescription and control. The book also identifies certain important visible and invisible variables which influence this level of comfort with foreign cultures (CFC).